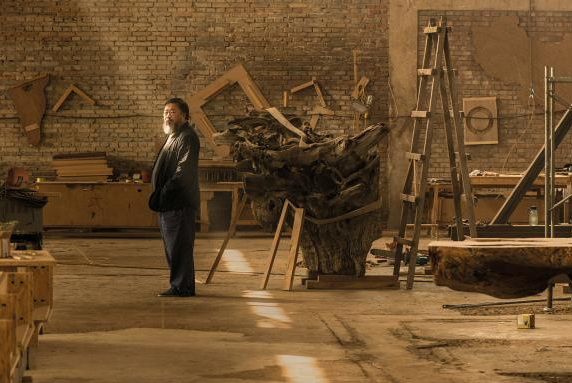 For someone who has been stopped from speaking, imprisoned, surveilled, “disappeared”, had his studio knocked down, his bank accounts frozen, his passport taken away and all the rest of it, Ai Weiwei has been remarkably successful at getting himself heard. And seen. Looking back through my writings of the past decade, I find reviews of Ai and his work popping up more frequently than those of any other artist. There was the big event with the sunflower seeds in the Turbine Hall at Tate Modern. All that stuff at the Serpentine. The marvellous show at the Yorkshire Sculpture Park. The German pavilion at the Venice Biennale! And the church of Sant’Antonin. And the Giudecca. Confucius did not say: “He who wants to be heard should first ensure he is silenced.” But if he had said it, it would have been a good point. Part of Ai’s ubiquity is down to the solidarity shown by the international art world as it has gathered around him and sought to protect him and broadcast his opinions. There are many things to regret about the antics of the art world in the age of the gewgaw, but its support of the world’s most notorious dissident is not one of them. The ingredient that has actually been hardest to focus on in all this noisy international dissonance is the art. So high has Ai’s profile grown that seeing over it to his work has become a challenge. I had to smile at the huge portrait of him that now flutters from the roof of the Royal Academy, advertising the show within. The last time I saw a portrait that big was the giant image of Chairman Mao that hangs outside the Forbidden City, on Tiananmen Square. One advantage of seeing Ai’s work in so many places has been the insight it allows into the adaptability of his moods. Every show had its own atmosphere. The one at the Yorkshire Sculpture Park was sweet and poetic. The one at Tate Modern was austere and portentous. In the church of Sant’Antonin, in Venice, it was all about the detail. In the German pavilion, it was all about the size. 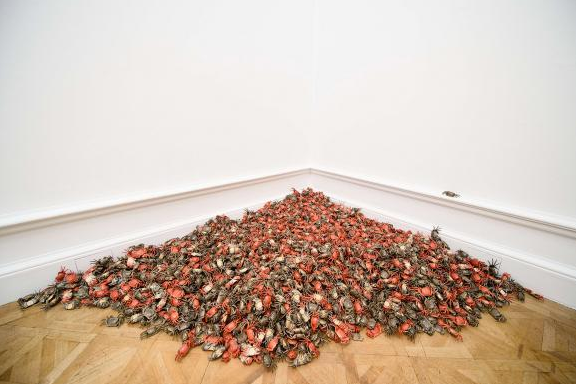 Now, at the Royal Academy, in his largest show to date in Britain, it’s the sculptural grandeur of his work that stands out. Of course there is politics, too. Everywhere. But there’s a sense as well that, in the final scheme of things, politics is just politics, while sculpture is something bigger, something eternal. Politics speaks the language of today. Sculpture speaks the language of for ever. It’s a mood conveyed from the first sight — a manmade forest of haggard trees that looms up before you in the courtyard of the Royal Academy. Leafless, ancient, gnarled, the petrified forest speaks of survival and experience, struggle and destiny. Not for nothing do trees play such a prominent role in so many of the world’s great myths. For the Vikings, the sacred tree, Yggdrasil, was the ladder that connected the earth to heaven. When Rembrandt made his famous etching of the three gnarled oaks on a hill, he was deliberately referencing the crucifixion of Jesus and the two thieves. Trees in art stand inevitably for their own struggle, yes, but also for ours. In the marvellous grouping of them arranged here by Ai Weiwei (paid for by some inventive crowdfunding organised by the academy), the mighty copse of blasted oaks achieves an immediate air of heroic resistance. It’s an effect deflated quickly, though, within the copse itself by the sudden appearance of a battered armchair of the kind you might watch the footie from on a Saturday night. Although it looks as if it is made of cheap plastic, the lumpy chair is actually carved from expensive marble. It refers, I read, to the one in which Chairman Mao is seated in his mausoleum on Tiananmen Square. For the first time at this event, but certainly not the last, the heroic and the banal play ping pong in the art of Ai Weiwei. The twisty trees strike a note of sculptural busyness that is mainly absent from the works beyond. Cubes. Rectangles. Circles. The shapes are usually spare, and it is only when you read the accompanying texts that your attention is directed to the complex messages hidden within. Thus, the long opening sequence of what look like circles on the wall turns out to be a map of China transformed into the profiles of a set of circular picture frames. 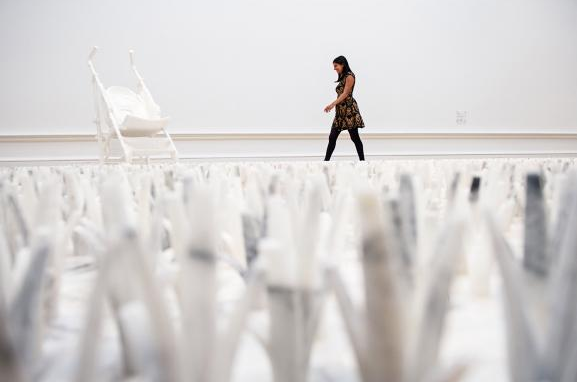 The most dramatic example of this enriched minimalism is the central installation, called Straight, where the neat piles of steel rods that fill the room have been formed from the twisted metal left behind by the Sichuan earthquake of 2008, in which thousands of Chinese schoolchildren were killed. Most died because the buildings in which they were taught were so shoddily erected. Gathering up the twisted steel evidence of this shoddiness, Ai has had every rod straightened again, and carefully stacked, in an act that not only memorialises the dead, but functions in some minimally magical way as atonement. On the surrounding walls, the name of every dead schoolkid has been carefully listed. Though Straight is clearly on the side of good, it is a feature of Ai Weiwei’s work that his moral positioning is often blurred. Much of what he does has a destructive edge to it. 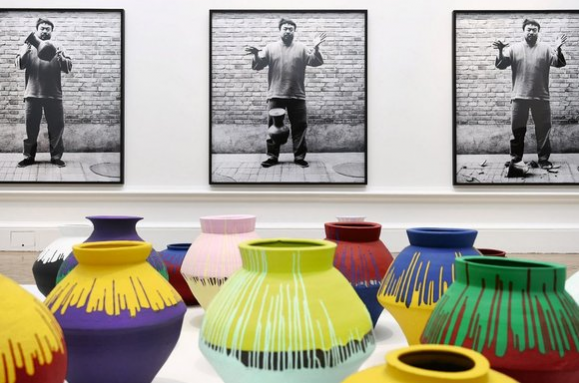 The three photographs that show him deliberately dropping a Han dynasty urn are intended as a comment on the destruction of China’s past begun by Mao Tse-tung during the Cultural Revolution. Maybe. But those of us who would never deliberately drop a Han dynasty urn, whatever the artistic cause, must surely feel uneasy at the nihilism of the act. I don’t feel too good, either, at the sight of 12 Han dynasty vases, and four neolithic ones, being dipped in lurid industrial paint as the world’s oldest civilisation meets Jackson Pollock. Ai’s furniture pieces in which original Qing dynasty tables and stools have been reconfigured into surreal new arrangements — a table with two legs; 27 ancient stools balancing in a circle — are intended as a tribute to the immaculate craftsmanship of China’s past. But they appear to see nothing wrong with destroying it, either. Imagine doing this to a Chippendale chair. 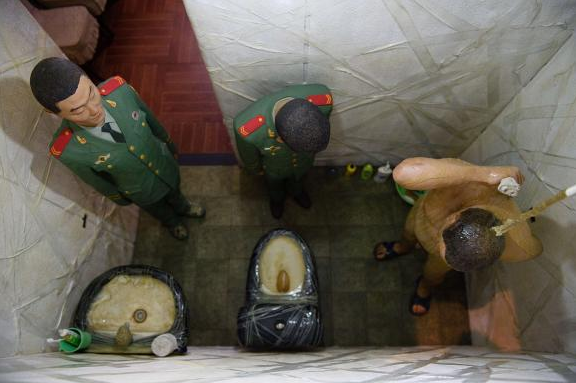 It’s as if the brutal modernisation embarked on by the communists in China finds not only an enemy in Ai Weiwei, but also, perversely, an echo. It’s interesting as well to see how what is essentially a nostalgic view of China’s past has managed to export itself as a chapter of modernism. If Ai were a British artist, he would be defending Georgian architecture against the destructive brutality of Norman Foster and co. Or perhaps, more accurately, lamenting the destruction of our city centres by the urban planners of the 1960s. None of this is, of course, obvious. 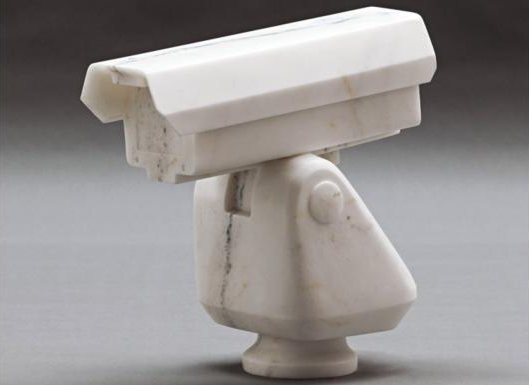 Neither minimalism nor conceptualism, the two aesthetic threads that combine in the minimal conceptualism of Ai Weiwei, have any interest in spelling things out. Both of them leave the understanding to us. Confucius did not say: “The man who leaves many gaps creates space for the hopes of others.” But had he said it, it would have hit a nail on the head.